The Enterprise has traveled back in time to the year 1968 to study, up close, Earth’s history, and a very tumultuous year in the late 20th century. 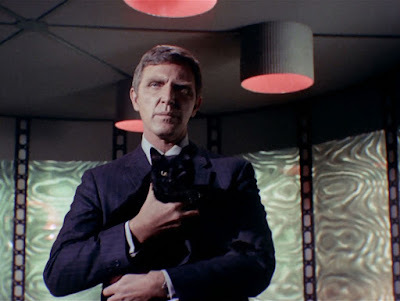 Surprisingly, the ship intercepts a transporter beam that originates from somewhere outside the solar system, and materializes on the pad Gary Seven (Robert Lansing), a human raised on another world, now working in secret as an agent to save Earth from self-destruction. 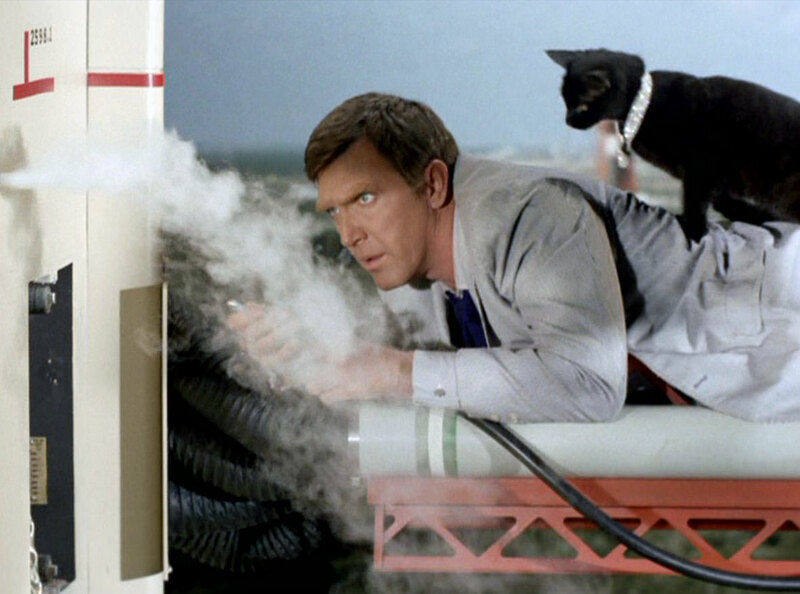 Captain Kirk (William Shatner) is reluctant to let Gary, or his companion -- a cat named Isis -- depart the ship before he learns more, but Seven escapes and begins conducting his mission, which involves the United States space program, and a missile launch. 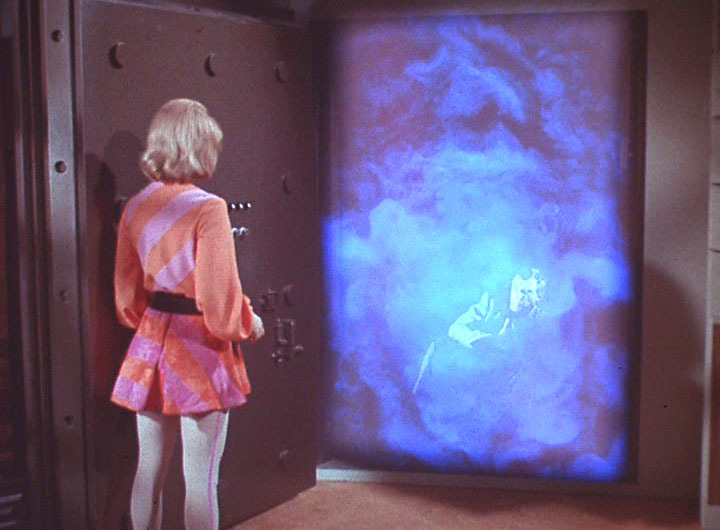 On the ground, Gary is assisted by a flaky secretary, Roberta Lincoln (Teri Garr), and a host of incredible gadgets, but Kirk and Spock (Leonard Nimoy) pursue him to the surface, fearful he is a danger, and attempt to stop his mission. They find, however, that he is an ally, and that they can trust him. “Assignment: Earth” should likely be judged as a “pilot” for a new series, and not as a Star Trek (1966-1969) episode, since that is the story’s genesis. Gene Roddenberry had hoped to launch a sci-fi series about Gary Seven’s adventures on Earth in the late sixties, but nothing ever became of it. This episode is Gary Seven’s only televised adventure. As a pilot, “Assignment: Earth” is very intriguing, in a 1960s kind of way. Gary Seven is well-played by Robert Lansing, who demonstrates the necessary gravitas to portray the role of an alien-trained agent on Earth. Delightfully, he also seems to be in “on the joke,” and does a great job as a straight man, both for Garr and the cat, who are scene stealers. Teri Garr is our comic relief, and for me, her ditzy routine seems a little dated, today. Also, it should be noted, Garr is apparently not a Star Trek fan (which is fine, of course), but that she once compared such fans to the people you encounter at “swap meets.” I’m not exactly certain what she meant by that remark, but I’m pretty confident it’s an insult. What she’s saying, basically, is a stereotype. The concept of “Assignment: Earth” is good too; that advanced, benevolent aliens might send trained humans back to Earth to prevent us from annihilating ourselves. They are sleeper cell agents, in essence, but with good intentions. Beyond these touches, Seven’s advanced tech, like the vault transporter, sonic-screwdriver-type pen, and hidden computer panel, are all a lot of fun. They all hail from the colorful “super-spy” world of such programming as Man from U.N.C.L.E (1964-1968) and Mission: Impossible (1966-1972), but with elements of Trek and Doctor Who (1963-1989) thrown in for good measure. A downside of the premise, however, is that it goes against a key pillar underpinning Star Trek. And that pillar is, simply, that the human race outgrew our infancy on our own, and, in maturity, stepped onto the galactic stage (circa the 23rd century). If aliens have been leading us by the nose all along then that accomplishment is undercut some. 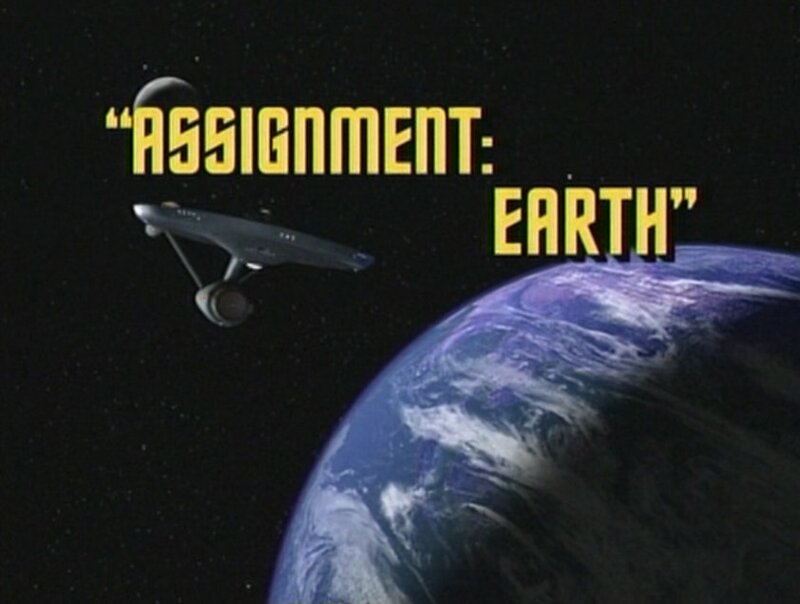 As a Trek episode, alas, “Assignment: Earth” isn’t so great. In fact, the episode is weak. Kirk and Spock are relegated to supporting roles, and their involvement in the adventure begs questions. Why is Starfleet undergoing the dangerous operation of time travel just for historical research? The Enterprise’s mission sets up the story details (the interception of Gary Seven) but doesn’t seem to track with what we know of time travel. Stories such as “The Naked Time,” “City on the Edge of Forever” and “Tomorrow is Yesterday” strongly establish that time travel is dangerous and should therefore be a restricted activity. I don’t know that “historical research” is a valid reason for such a risky operation. I know it is impolitic to make such a remark, but I also find the climax of “Assignment: Earth” slow, and somewhat tedious. Kirk and Spock are held captive, restrained, in a control room for a while, and it seems to take forever for Seven to make the modifications on the rocket gantry. It’s slow-going, followed by additional slow going. Kirk and Spock are passive observers not only in the control room (before they do engineer their own escape) but in Seven’s office too, while he destroys the rocket in the atmosphere via his computer. Finally, it rubs me the wrong way to have Spock inform Lincoln and Seven that they have several interesting adventures ahead of them. First, in universe, this is flat-out wrong. We have seen on many occasions that it is preferable not to influence people with knowledge of the future (see: Captain Christopher). Certainly, Spock -- of all the characters -- would be prudent about revealing such information. 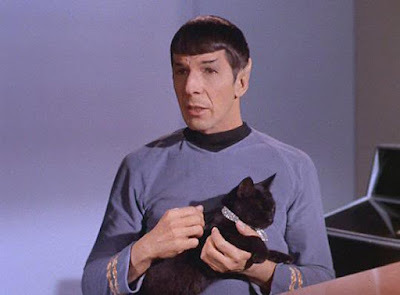 In terms of the series’ integrity, the dialogue is also a mistake, as it seems Spock is speaking directly to the audience, endorsing the idea of a Gary Seven series. It just feels a bit, well, cheap. More like marketing than actual drama. It is intriguing that Spock’s description of 1968 hits surprisingly close to the mark in terms of historical events (an assassination, and so forth), but I can’t state that this is a reason to recommend the episode, or judge it as a success. Finally, “Assignment: Earth: features one interesting connection to future Trek lore worth writing about. Gary Seven “beams” across star systems at the start of the hour, and that’s transwarp beaming in a nutshell. 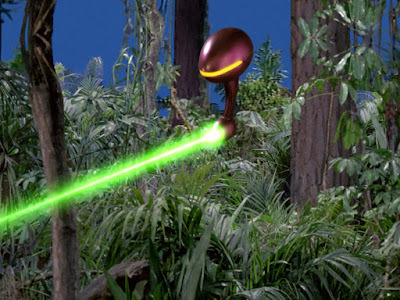 Transwarp beaming plays a major role in the Kelvin universe, in Star Trek (2009) and Star Trek: Into Darkness (2013). I have read many Star Trek fans complain about this dramatic device or gimmick, but “Assignment: Earth” clearly sets up the possibility, and the possibility in the 23rd century era of Kirk and Spock. Thank You for pointing out the "transwarp beaming" aspect of "Assignment: Earth." I read an article on another website today which name-dropped Star Trek: Into Darkness and complained about it not being good Trek. I've pointed others to your review of the film many times, in which you expertly point out why it is, indeed, worthy of the Star Trek name. Which brings me to my primary nitpick regarding this episode: We've already been shown two alternate methods of time travel, in "The Naked Time" and "City on the Edge of Forever." Why would the Federation, and the Enterprise, choose to time travel using the Sling Shot effect, which nearly tore the ship apart both times it was employed in "Tomorrow Is Yesterday"? It was also utilized in Star Trek IV: The Voyage Home, causing a psychedelic trip featuring giant Kirk and Spock heads. It makes more sense to just hop through a great big space donut that talks, its last words being "Let me be your gateway." I guess the Enterprise crew just wants to do things the hard way. That's how they roll through time in the 23rd Century. "Assignment: Earth" spawned a five-issue comic book series from IDW, written and drawn by John Byrne. I read them and found them to be enjoyable. One issue intersects with the aforementioned "Tomorrow Is Yesterday." Byrne is clearly a fan of The Original Series, and is having fun as well. In spite of its flaws and its overt spin-off ambitions, I still enjoy "Assignment: Earth." However, in retrospect, it seems to me that Gene Roddenberry had mentally checked out of Star Trek and wanted to move onto new things. This would come to pass with Season Three, when GR handed the series to Freddie Frieberger, and left to write movie scripts while the series was still on the air. "Assignment: Earth" is larded with just about every flaw it could possibly have and still make it to air, yet I have always enjoyed watching it! I think the wonderful cast is largely responsible, along with the fact that the story is intriguing despite being shot full of holes. 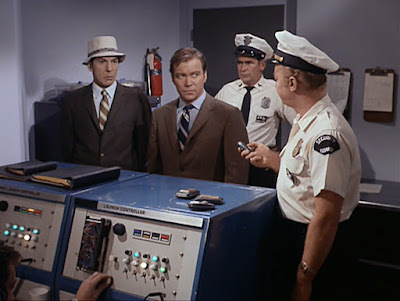 On initial and rerun airings, AE neatly fit within current events, which I've noted before is a little-talked about aspect of Star Trek that impacted the original TV audience in fundamental ways. It was definitely weird to see a Saturn rocket on the launchpad as an aspect of the distant past within a current TV show about the future! Watching Star Trek as the Apollo space program was unfolding in real time induced one to ponder about the future it would lead to, which included a fundamental expectation that we would continue to move into space inexorably. So Assignment: Earth, along with Tomorrow is Yesterday, hold a higher place in the hearts of some of us who viewed them before the Apollo program withered, before Skylab, etc. What's wrong with Assignment: Earth is everything you mentioned, John. It is too obviously a setup for another show and thus out of kilter with the Star Trek ethos. It is too slow-moving and too actionless, and in particular Kirk and Spock are hanging about with nothing to do. The premise of their orbiting Earth for historical purposes does, as you point out, make time travel too easy and unconcerning in-universe. That problem could have been solved by having the Enterprise intercept the mysterious beam in its usual time setting, and go back in time only to determine whether the time-traveler was friend or foe. This story grew out of Gene Roddenberry's idea to have the Enterprise go back in time to prevent the Kennedy assassination, a story Roddenberry determinedly proposed repeatedly over the years (thank God he didn't get it approved for The Motion Picture, either) and never got written beyond a certain point--which is why this episode ended up half-written and half-baked. He no doubt intended, if the pilot worked and went to series, to work that Kennedy plot into the new show. I would have liked to have seen that series, but AE as a jumping off point shows us why it probably couldn't happen. They would have needed Teri Garr (whose performance here is just dead-on) to play adroitly the scatterbrained but insightful Roberta Lincoln--and they would have had difficulty signing her for a series. Gary Lansing was expensive and had a reputation for being difficult to work with, which is why Twelve O'Clock High replaced him with Paul Burke after a year. And it would have been an expensive production, given all the equipment Gary Seven needed. It probably would have gone campy quickly, as Man From Uncle did once it went into color, because doing such a show seriously was terribly expensive. No matter how many times I see this one, it leaves me saying "WTH did I just watch?" This episode could have been a pilot by itself without the Star Trek angle. Instead, it was a poor way to close out the second season. Lansing would have been a great villain in a proper Trek episode. Time travel stories always present a paradox. If someone goes back in time, they risk altering the past which changes the time zone they came from. Ray Bradbury's story A Sound of Thunder is a classic example. If they don't, then they might risk their present because they didn't do something that had to be done by them in the past. Even if Gary Seven had failed, the Enterprise orbiting the Earth could have destroyed the warhead with their phasers or photo torpedoes.